Sources give the date of the 1st month of 1856 for this print. One of the actors portrayed is Nakamura Tomozō (中村友三) as Usami Saburō [?] (宇佐美三郎). Another is Onoe Tamizō II (尾上多見蔵) as Kobayashi no Asahina (小林ノ朝比奈) in the lower right. The onnagata on the right side is probably Nakayama Nanshi II (中山南枝) as a high ranking courtesan as a stand-in for the goddess Benzaiten. 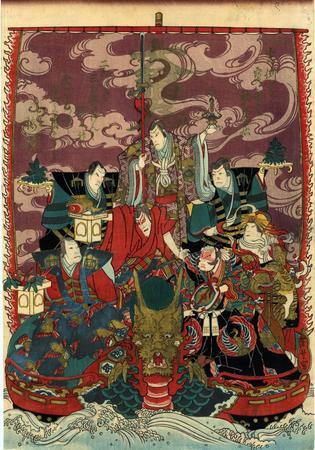 The man in the red robe in the center represents Daikoku as can be inferred by his gift-dipensing magical mallet which lies atop a small stand he is holding. The man at the top must be Bishamon, a god of war and wealth. Among the other actors is Jitsukawa Enzaburō I (実川延三郎) as Soga no Jūrō (曽我ノ十郎). This print in the Lyon Collection makes for an interesting comparison with the only other example we could find, the one in the collection of the Museum of Fine Arts in Boston. Their print has none of the metallic inks used on the one shown here. Nor does it have the text seen at the top also in metallic inks, printed vertically, against the sail. Does it mean that this one owned by Mike Lyon is from a deluxe edition? Probably. It was and still is common practice to stage a Soga play at New Year's. Can you imagine a treasure boat being moved forward surrounded by stylized waves and loaded down with this crew of remarkable actors? If this is what was done at the time then it must have been awe inspiring for the audience that got to see such a spectacle. It is also interesting to note that despite the fact that this print is of a standard ōban size the metallic inks give it the feel of a surimono, another type of elegant print which would appear at New Year's.